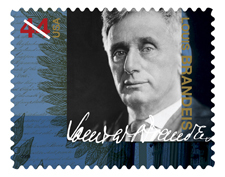 As Louis Brandeis returns to the public consciousness through the issuance of a U.S. postage stamp in his honor and the publication of a new biography, the university will pay tribute to its namesake during a Brandeis Celebrates Brandeis salute in September. Brandeis Celebrates Brandeis will recognize the life and achievements of the former U.S. Supreme Court Justice at two events – a stamp dedication on September 24 and a Meet the Author program with Brandeis biographer Melvin Urofsky on September 29. Both events are free and open to the public. On September 24, James J. Holland, Boston’s postmaster general, and Reinharz will dedicate the new Louis Brandeis stamp at 1 p.m. at the base of the Brandeis statue on campus. Frank Gilbert, Brandeis’ grandson, will speak at the ceremony. William Bowen, “The Singing Postman” who works in the Brandeis post office, will perform. A commemorative program will be distributed that includes a special cancellation for the Brandeis stamp. The Brandeis stamp, part of the U.S. Postal Service’s 2009 commemorative stamp program, is one of four in the Supreme Court Justices collection. Joseph Story, Felix Frankfurter, and William J. Brennan Jr. are also honored. 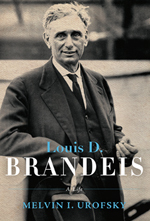 On September 29, Urofsky will make his first Boston area appearance when he discusses “Louis D. Brandeis: A Life” at a Meet the Author event at 5:45 p.m. in the Faculty Club. A reception will follow and books will be available for purchase. Urofsky’s work is the first full-scale biography of Brandeis in 25 years and chronicles the remarkable story of Brandeis’ impact on American society and jurisprudence, and the electrifying story of his time. Urofsky, a noted scholar and professor of law and public policy and professor emeritus of history at Virginia Commonwealth University, has written and edited 52 books, including seven volumes on the life of Brandeis. Urofsky will be introduced by Steve Whitfield, the Max Richter Professor of American Civilization at Brandeis. Both events are sponsored by the Louis D. Brandeis Legacy Fund for Social Justice, which supports Brandeis students, enhances campus life, and promotes the issues of social justice that Brandeis championed throughout his life. Since it was established in 2006 by a generous, anonymous gift from a Brandeis alumnus, the Legacy Fund has sponsored a series of initiatives designed to help students, enrich the university community, and address social justice concerns on and off campus.